the E-Mail link at the bottom of this page. This photo is believed to be of form 6 lower or upper, 1947/1948.with Miss Silk. Muriel Stocks is third from the left on the middle row. 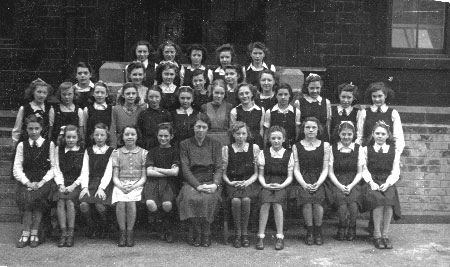 Betty Armitage is fifth from the left on the middle row. Peggy Jarvis is sixth from the left on the middle row. June Hanwell is third from the right on the front row. Margaret Bullard is fourth from the right on the front row. This photo is believed to be of form 1a 1944/1945.